Here is another intriguing tidbit from that August 1970 issue of Creepy that I featured a few days ago, for the Crawling Hand advertisement. So how did they convince young, horror-comic-reading Baby Boomers to put out their butts? In this case, it was by appealing to their wallets, their physical fitness and their love of surfing. 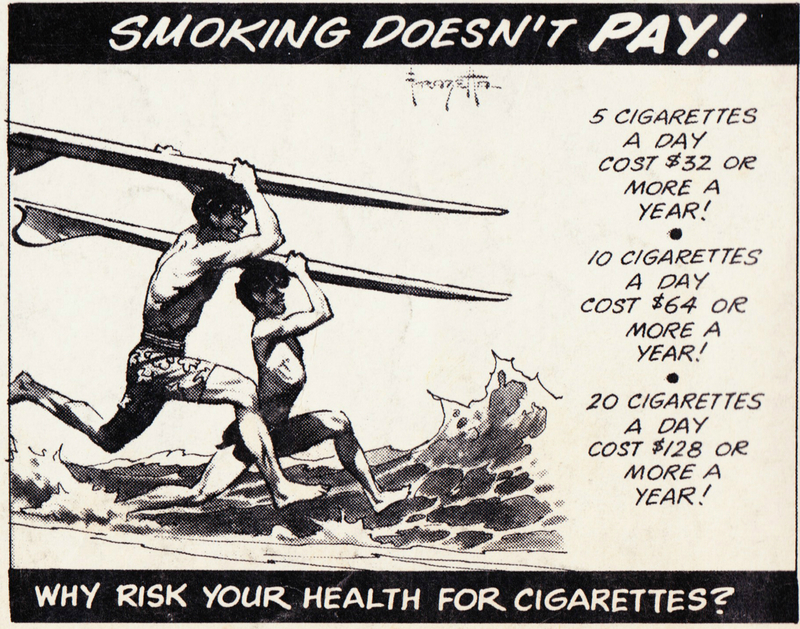 The six-panel strip, by Hall of Fame artist Frank Frazetta, opens with a pair of young smokers admiring a Dave, a formerly "boardless hodad"2 who is now riding the waves with a great surfboard and an attractive girl. 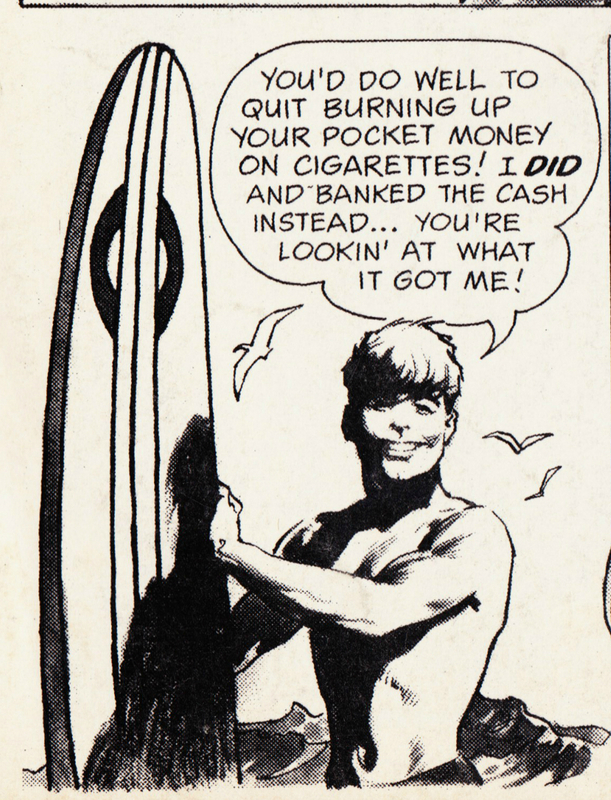 They ask Dave how he paid for his custom surfboard when they barely have enough money to pay for their "smokes." Dave offers to let them try the board out, but one of them admits that he's "too winded" from smoking to get out on the surfboard. Which brings Dave to the point, as he stares out of the comic strip at the reader: "You'd do well to quit burning up your pocket money on cigarettes! I did and banked the cash instead ... You're looking at what it got me!" And then super-buff Dave exits stage left with his gnarly surfboard and bikini-bound girlfriend. "We are a magazine publishing company that is in business to entertain and enlighten our audience. We don't publish politically-oriented magazines (3 of our titles are comics-format), but we do get involved in the serious issues of our times. "... Still another involvement for us is the running of our Anti-Cigarette Smoking ad. "Created at our own expense, this half-page Comics-Format ad "EASY WAY TO A TUFF SURFBOARD!" (written by Archie Goodwin, drawn by Frank Frazetta) has been running in all Warren Magazines for the past 5 summers. It's not the kind of ad you'll see in any other publication in America. It doesn't help sell our magazines, but we run it because we believe the message is important (more important than advertising revenue) — and deserves exposure in our pages." And, for that sentiment, I think we should say "hats off!" to Warren and the folks behind Creepy's ghouls and goblins, who were decades ahead of the curve in their mission to get America to stop smoking. 1. The other half of the back cover features an advertisement for Conan adventure books, each costing 75¢ or 95¢, from Captain Company. 2. Urban Dictionary says that hodad is a "50's term for a greaser, someone who hung out at the beach, but definitely not a surfer."